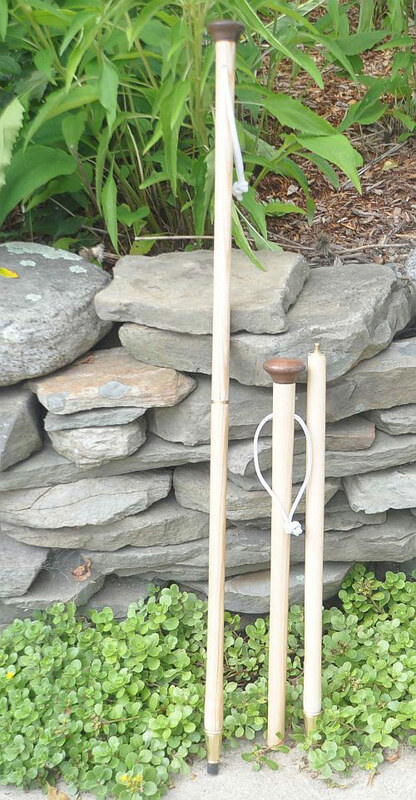 I hand-make rugged beautiful custom Hiking Staffs for nature lovers. The staff is custom sized to meet your requirements. It can also be used as a camera monopod to enable you to get sharp photographs with a standard camera that has a ¼" 20 TPI female fitting. It disarticulates for ease of storage and transport. When you order one of these, I'll contact you and tell you how to custom-fit the staff. Features of the staff include the following. The tip is brass with a stainless steel point that can be replaced with a rubber tip (both are included with the staff). The stainless steel point is great for walking on rough terrain while the rubber tip is exceptional on smooth pavement and floors. The screw-together join on the two staff pieces is brass. The staff itself is exceptionally sturdy and turned on a lathe. It varies from approximately 1" to ¾" in diameter. The length depends on your request. The head is attached with a ¼" 20 TPI screw. You can remove the head and screw on a camera so it is used as a camera monopod to enable you to take steady shots with the camera. The comfortable head is mushroom-shaped to fit your hand. All of the wood is finished with Spar Varnish to assure that it is waterproof. The custom-turned staff itself is White Ash while the head is Black Walnut. A leather strap is attached to the top of the staff to enable you to easily grip the staff. I custom-make these to fit your request. If you order one I’ll tell you how to tell me the length that you will need.